Challenging History in the Museum explores work with difficult, contested and sensitive heritages in a range of museum contexts. It is based on the Challenging History project, which brings together a wide range of heritage professionals, practitioners and academics to explore heritage and museum learning programmes in relation to difficult and controversial subjects. The book is divided into four sections. Part I, ’The Emotional Museum’ examines the balance between empathic and emotional engagement and an objective, rational understanding of ’history’. Part II, ’Challenging Collaborations’ explores the opportunities and pitfalls associated with collective, inclusive representations of our heritage. Part III, ’Ethics, Ownership, Identity’ questions who is best-qualified to identify, represent and ’own’ these histories. It challenges the concept of ownership and personal identification as a prerequisite to understanding, and investigates the ideas and controversies surrounding this premise. Part IV, ’Teaching Challenging History’ helps us to explore the ethics and complexities of how challenging histories are taught. 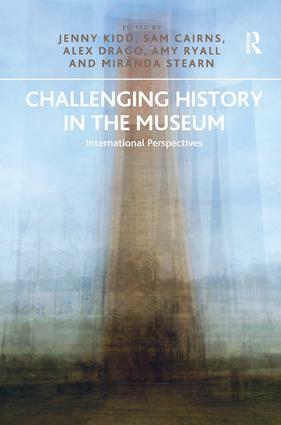 The book draws on work countries around the world including Brazil, Cambodia, Canada, England, Germany, Japan, Northern Ireland, Norway, Scotland, South Africa, Spain and USA and crosses a number of disciplines: Museum and Heritage Studies, Cultural Policy Studies, Performance Studies, Media Studies and Critical Theory Studies. It will also be of interest to scholars of Cultural History and Art History. Jenny Kidd is Lecturer in Journalism, Media and Cultural Studies at Cardiff University, UK. She is co-editor of Performing Heritage (with Anthony Jackson, 2010), has published widely on museums, new media and participatory practices, and is one of the founding members of the Challenging History network. Sam Cairns manages the Cultural Learning Alliance. Sam has been the Director of the Challenging History network since 2009. Alex Drago has been Education Manager at the Tower of London since 2007, having originally joined Historic Royal Palaces in 2006 to work at Hampton Court Palace. Amy Ryall is External Engagement Projects Officer for the Faculty of Arts and Humanities at the University of Sheffield, UK . Miranda Stearn is Arts and Heritage Development Co-ordinator at Orleans House Gallery, She is also currently completing a PhD in Art History at the Courtauld Institute of Art, UK.